Lock in a great price for Hotel Sajmino – rated 8.1 by recent guests! Polecam. Cisza, spokój i dobra lokalizacja. Stosunek ceny do jakości bardzo dobry. Polecam ! Bardzo miła obsługa, czysto w pokoju i dobra cena. Bardzo smaczne urozmaicone śniadanie. Czyściutko. Duży pokój. Номера были большие, но мансардными. Немного непривычно. Завтрак очень хороший. Понравился нам и детям. Die Betten waren sehr bequem, das Personal sehr freundlich und hilfsbereit. Die Ausstattung der Zimmer sehr angenehm. Das Bad war geräumig mit bequemer Duschkabine. Das Hotel lag außerhalb der Stadt in ruhiger Umgebung und doch nah am Ort. Hotel wspaniały pod każdym względem, wraz z bardzo miłą obsługa. Hotel Sajmino This rating is a reflection of how the property compares to the industry standard when it comes to price, facilities and services available. It's based on a self-evaluation by the property. Use this rating to help choose your stay! 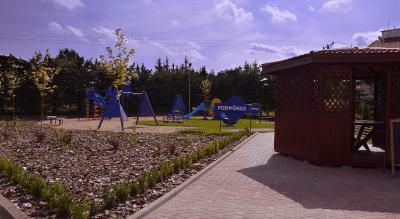 Featuring a garden, Hotel Sajmino is located in Ostróda, 2.8 miles from Stadium Ostroda. With free WiFi, this 2-star hotel offers a 24-hour front desk and a shared lounge. Guests can use a terrace. At the hotel, all rooms have a desk, a flat-screen TV and a private bathroom. Guest rooms have a closet. Guests at Hotel Sajmino can enjoy a continental breakfast. The accommodation has a playground. You can play ping pong at Hotel Sajmino. The nearest airport is Olsztyn-Mazury Regional Airport, 62 miles from the hotel. When would you like to stay at Hotel Sajmino? House Rules Hotel Sajmino takes special requests – add in the next step!